In order to defend convoys it became necessary to find a way to shoot down the high flying Focke-Wulf Fw 200 Condor aircraft which would shadow convoys radioing their position to enable U-boat wolf-packs to lie-in-wait for them. The Sea Hurricane Mk. I A, (1941), fitted with catapult spools, slinging gear, arrester hook and naval radio for use from C.A.M. ships (Carrier Aircraft Merchant), was the solution, the Sea Hurricane was introduced in the spring of 1941 and soon became known unofficially as the ‘Hurricat’. Most Hawker Sea Hurricane's were obsolete RAF Mk. 1's fighters converted to operate from a merchantman fitted with a catapult (C.A.M. ship - Carrier Aircraft Merchant). The first enemy aircraft to be destroyed by a catapulted Sea Hurricane IA, a Focke-Wulf Fw 200 Condor, was shot down on August the 3rd 1941. The Sea Hurricane pictures on this page depict the only surviving ‘Hurricat’ which is carefully maintained in airworthy condition by the Shuttleworth Collection and regularly displayed at air-shows held at their Old Warden Aerodrome in Bedfordshire. These pictures of a Hawker Sea Hurricane are Copyright © June 2014 Siteseen Ltd. We only authorise non-commercial picture use and particularly encourage their use for educational purposes. This Hawker Sea Hurricane or ‘Hurricat’ picture is not in the Public Domain. 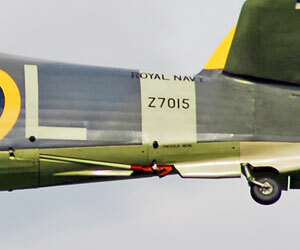 1) Siteseen Ltd. must be credited as the copyright holders wherever our Hawker Sea Hurricane pictures are used. 3) Use of this Hawker Sea Hurricane picture, or any of our pictures on websites re-distributing copyright free material is strictly prohibited.